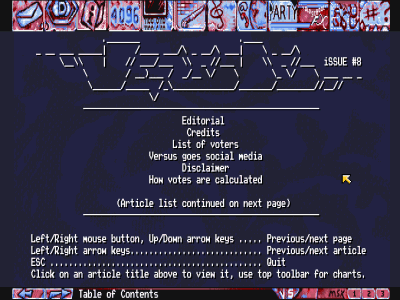 So nice to see an Amiga diskmag and charts in 2018 and all the effort you put in this baby! It was a real pleasure to write some lines for you. Keep it up! Keep on doing what you guys are doing.. Because it's ace! I have scrolled through all the articles once and I can definitely say that this is a good diskmag by today's standards. Obviously a lot of work and dedication have gone into the making of this diskmag. The amount of articles is acceptable, there is some interesting content, and I also like the font and the background music. Well done! Nice work! Interesting to see how much thought went into the voting mechanics. Will give it a thorough read on the weekend. I like the idea of having prods embedded inside the mag btw! Sorry about that! We noticed the issue at the last minute and were already past our deadline, so I wasn't able to figure out a fix in time. This issue also requires 1 meg of RAM to run due to the sheer size. I'll revise the engine for the next issue to be less dumb codewise and actually store the articles in a packed format so we won't have size-related trouble anymore. Browsed it quite some and I find it really cool (probably will read it all during weekend). Thanks for your effort guys, keep it up! A new diskmag.. Excellent, thx !! Great work, thanks for your efforts in putting this together. And nice music in this issue aswell. Cool, nice to see a good old diskmag being released these days. 40 articles, 4 tunes, 4 platforms, four months planning-release, and not to forget a forest of supporters of Versus 8. Thanks to all who believed in this journey and we keep the legacy of chartmags bouncing. A tribute to voters can be viewed in this thanktro, and feedback, suggestions or any news you want us to publish here. ps @Adok: Im eager to read your next release of "today's standard". Very nice... both visually and content remember to the old days... :) and fine music, too.